We focus on the rodent spatial memory system as a model for understanding how cognitive functions - like internal representation of external space – are implemented at the circuit and cellular level. 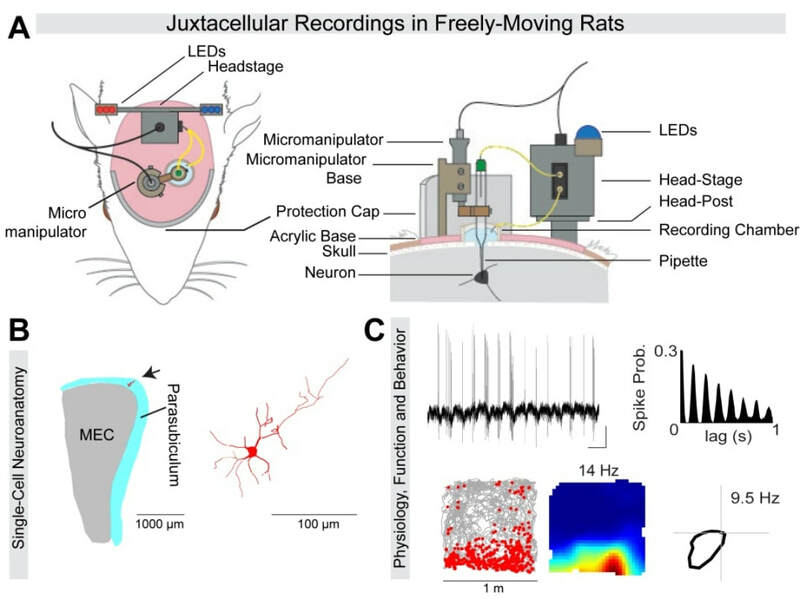 Experiments are centered on newly-developed techniques for performing juxtacellular (and whole-cell) recordings form single neurons in freely moving rodents (see below). These methods allow to visualize neuronal circuits in animals engaged in unrestrained, natural behaviors. In combination with molecular and anatomical techniques, we aim at dissecting the structural determinants of cognitive representations of space in the entorhinal-hippocampal circuit. We have recently developed (Burgalossi et al., Neuron 2011) and further optimized (e.g. Tang et al., Nature Protocols 2014) a juxtacellular recording method, which allows morphological identification of single neurons recorded in freely-moving rats (see example in Figure 1). This approach can provide insights into the cellular/molecular identity, microcircuit structure and plasticity of individual neurons, recorded during unrestrained behaviors. Figure 1. Morphological identification of single neurons, recorded in freely-moving animals. Overall, our general approach is to take advantage of (i) single cell identification and (ii) single-cell stimulation techniques for gaining insights into the structural correlates and plasticity of spatial coding in the entorhinal-hippocampal circuit. Our single-cell approach is currently complemented with more standard optogenetic and extracellular recording techniques. (i) Single-cell labeling in behaving rodents. We have recently provided evidence for structure-function relationships in the superficial layers of rat presubiculum (PreS) (Preston-Ferrer et al., eLife 2016). We found that anatomically, L2 and L3 are composed of distinct principal cell types, which different in molecular identity, morphology and long-range projection targets. By recording and identifying single HD cells in passively-rotated rats (Video 1), we found that HD responses were largely contributed by L3 neurons. By reconstructing long-range axonal projections of labeled HD cell, we provided direct anatomical evidence that PreS HD neurons project to the downstream medial entorhinal cortex (Figure 2). Figure 2. Identified long-range projections of PreS head-direction cells. (A) Top, polar plots (firing rate as a function of head-direction) showing sharp head-direction tuning of two pyramidal PreS neurons projecting to the MEC (2D projection from parasagittal sections shown below; dendrites in black, axons in red/blue). Their axons travelled caudo-laterally before reaching MEC and branching in layer 3. Scale bar, 200 mm (B) High-magnification micrograph of a DAB-stained HD axon showing close-up on the axonal branching upon entry in L3. (C) Superimposed axonal arborization on a parasagittal MEC section stained for calbindin (red). Inset shows high-magnification view of the axonal boutons (arrowheads) in MEC L1. Adapted from Preston-Ferrer et al., 2016. Another research line has focused on the dentate gyrus (Diamantaki et al., eLife 2016). By juxtacellularly recording and identifying single neurons in freely-moving rats, we confirmed a sparse coding scheme in the DG. The minority of active GCs displayed more complex dendritic architectures compared to the inactive ones – providing a possible link between structural and functional heterogeneity among the GC population (see also our recent review on structure-function relationships in the rodent hippocampus, Preston-Ferrer and Burgalossi, CTR 2017). We are currently using juxtacellular labeling techniques for resolving the cellular identity, local and long-range axonal projection targets of functionally-identified neurons in the entorhinal-hippocampal circuit. (ii) Single-Cell Stimulation in behaving rodents. We have recently demonstrated that juxtacellular stimulation of silent GCs in freely-moving animals can be sufficient for inducing place field activity (Diamantaki et al., Current Biology 2016). Specifically, evoked theta-rhythmic spike trains were more efficient for priming spatial activity in the dentate gyrus (Figure 3) and thus recruiting silent granule cells into the coding population. In the rodent PreS, we found that HD coding were strongly resistant to external manipulations of spiking activity (Coletta et al., Journal of Neuroscience, in press)- in line with the predicted stability of an HD attractor network. We are currently testing the plasticity rules of spatially-modulated neurons in the entorhinal-hippocampal circuit by imposing temporally-patterned spike trains in freely-moving rats (and mice) exploring open-field arenas. Figure 3. Juxtacellular stimulation induces rapid place-field formation in silent hippocampal neurons. (A-B) Theta-rhythmic spike train evoked by juxtacellular stimulation (arrowhead) in a silent granule cell in a freely-moving rat. Autocorrelogram in B (~8 Hz rhythmicity). (C) Spike-trajectory plots and rate maps before (left) and after stimulation (right). Evokes spikes (black circles) and spontaneous spikes after the stimulation (red circles) are indicated. (D) Lap-by-lap analysis for the recording shown in (C). Note the rapid emergence of a place field at the stimulus location.